"The sight of Isa on the podium lifting the trophy with his teammates was the perfect image - the symbol of what all of us at Leinster have been working so hard to achieve." Leinster Rugby Head Coach Leo Cullen reflects on his favourite image from a season like no other; an historic first ever Champions Cup and Guinness PRO14 double for the club. In Double Delight, the Sportsfile team of photographers, in conjunction with Marcus Ó Buachalla, retrace each game of a momentous 2017/18 season. 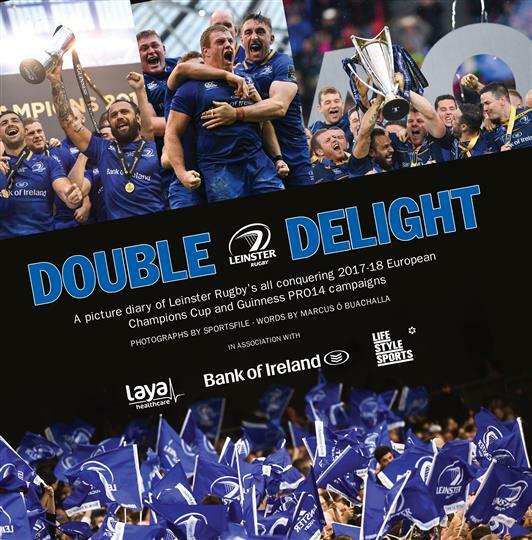 This book is now available with all profits going to the two Leinster Rugby charity partners, MS Ireland and the Down Syndrome Centre.